Recently I purchased a set of three perfect, crochet edged linen doilies from an antique dealer in Victoria who I'd found (of all places) on Instagram. She often has lovely linens to sell, but these ones grabbed my attention because I could immediately envision a stitchery sewn carefully onto their starched white centres. ...using my Bible as inspiration. I cut a piece of Parlan to fuse behind the fabric before I began the embroidery as it's a tad thicker than my usual Weaveline stabiliser. Linen of this age can pull in different directions very easily so having a slightly dense backing keeps everything nice and straight. ...and then I think you might receive the pattern as a gift next weekend. Mr E and I are off to parts unknown, and some parts known well, over the next few days. May your week be as wonderful as I hope ours will be. Oh I would love that as a gift. Yes please - that little embroidery pattern would make the perfect gift to encourage a friend. What is more beautiful than a scripture like this? It is full of life!! What a beautiful design and scripture!! This would be a special gift! Yes, I would appreciate this lovely pattern as a gift for Easter, one for me and one to gift to someone else. Thank you for the many opportunities to make someone else feel loved and special. Be safe in your travel and God Bess. 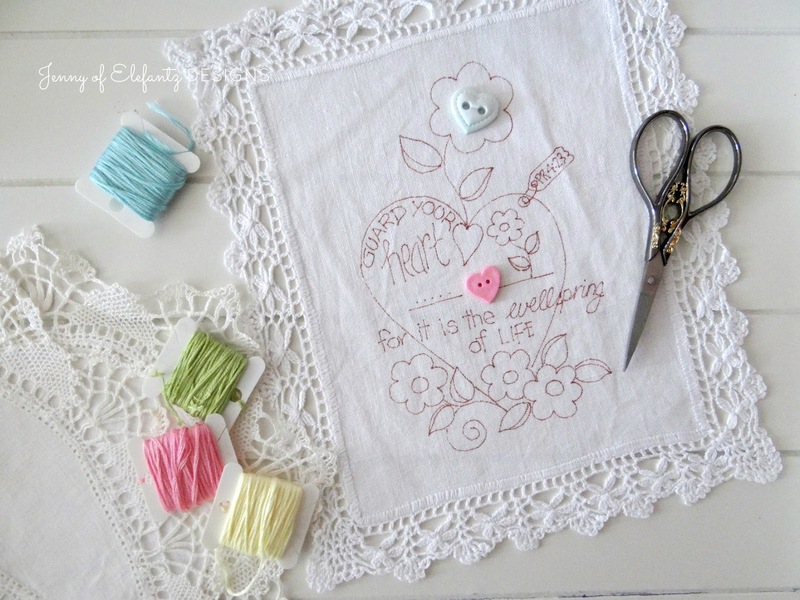 Such a lovely embroidery pattern! 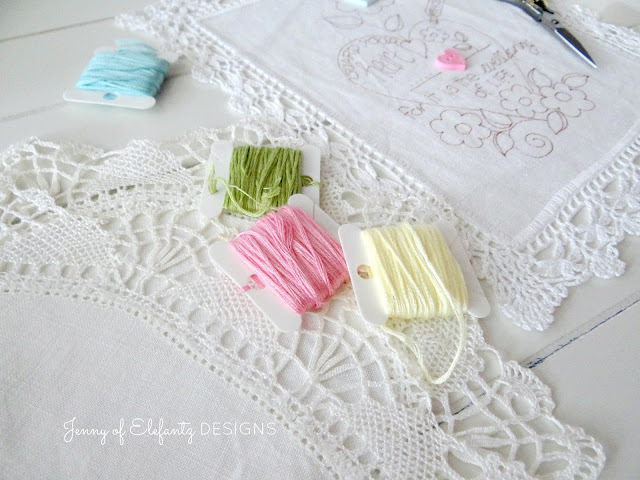 I am motivated to look through my vintage linens, so that I could make a cushion as well. Enjoy your time with Mr. E! What a great way to use vintage linens! Your colors and embroidery are always so beautiful and cheering. Thanks for sharing it with us. Yes, I would definitely like that!! Thank you so much for another beautiful pattern to inspire us! I appreciate your generosity and creativity. I hope that you two have a wonderful adventure! This is Lovely. You are such a thoughtful person Jenny, thank you so much! Lucky you to find such beautiful linens! I LOVE the design! Yes that would be a really nice gift. Do you always stabilize your fabrics before embroidery? Is it the water-soluble kind? Yes, I always stabilise and I use a permanent pen for tracing. Look at the link in my sidebar for my sewing essentials blog post. It explains everything. Yes, pleas and thank you. I love all your designs. You overflow with lovely Stitchery designs and this one on a linen lace edged doily is precious. Safe Travels with Mr. E and enjoy every moment dear. <3. P.S. But of course I'd like that! It's a wonderful design. Somewhere around here, I might have a good piece of linen for it, too. =) Have a wonderful few days wandering. I expect you'll sew some along the way, too. And recuperate and be refreshed and renewed. I'm so glad for this trip! I think it would be the best gift ever. Your stitchery really compliments the hankie, so sweet. Hope you are enjoying a lovely break with Mr E and return feeling refreshed and migraine free. Thank you for your godly encouragement and for sharing your lovely talents with us. I pray your Easter is glorious!! He IS risen!! 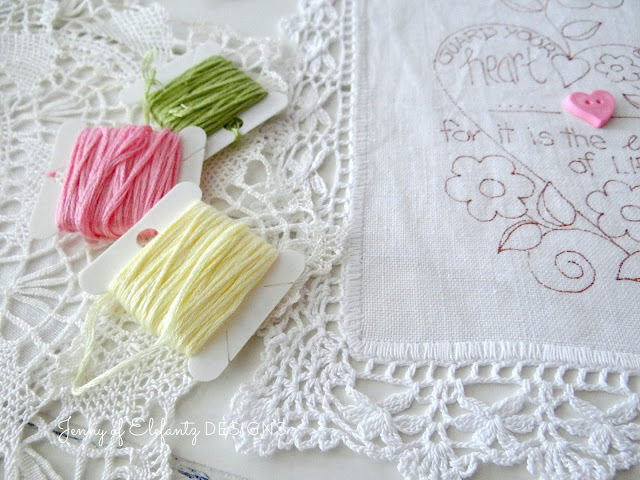 I love that you are using vintage linen to stitch on! And it's going to be so lovely. 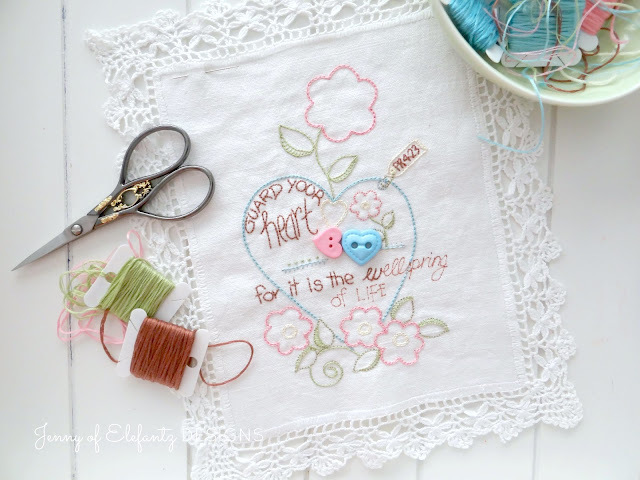 Thanks so much for linking up to last week's Stitchery Link Party. Aloha hugs!